A judge last month quietly voided a controversial Montebello trash contract, one that four years ago prompted bitter political fights and culminated in a referendum attempt, a recall and potentially costly lawsuits. Judge James C. Chalfant ruled on July 26 that the city’s contract with Athens Services, also known as Arakelian Enterprises, violates Proposition 218, which restricts the imposition of taxes, assessments, fees or charges by a city on individuals based on their ownership of residential property ownership. He rejected claims that the contract violated competitive bidding and non-exclusivity requirements as grounds for voiding the contract, claims that nevertheless served as popular criticisms of the contract when the city council approved it. The ruling is a victory for Montebello resident Mike Torres, who sued the city in 2009 over the contract. “The petition for writ of mandate was granted and the Athens Contract is void,” Torres’ attorney Stephen Miles told EGPNews Wednesday. 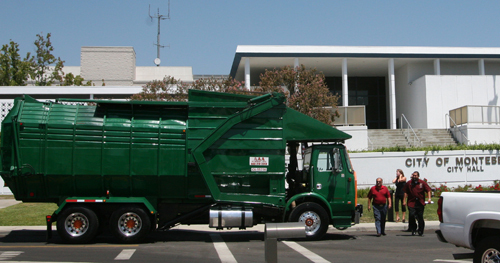 The Montebello city council in 2008 approved a waste-hauling contract that granted Athens Services an evergreen, exclusive rights to service commercial properties, including multi-unit residential rental properties. A coalition of commercial waste hauling companies that would no longer be allowed to do business in Montebello helped fund a campaign against the contract and those who approved it. In 2009, Torres filed to get a write of mandate to stop the contract from going into effect. According to the ruling, the city will be ordered to suspend its contract with Athens Services. Athens can appeal the ruling. Mere days before Chalfant’s ruling voiding the trash contract, the city of Montebello filed a lawsuit claiming three former city council members received campaign donations in return for approving the Athens contract. The council members named were Robert Urteaga, Rosemarie Vasquez and Kathy Salazar. This is a great example of a Kharmic Boomerang. The alleged near half a million $ Athens’ dropped on Montebello to support the gang of three, recall Bill, and influence the electorate of Montebello have given them just about nothing. I wonder whether this will cause the Justice Department’s investigation of the election irregularities allegedly abetted by Montebello officials at the time, and resulted in 30+ police complaints by Recall supporters alleging Athens’ thugs intimidated, physically blocked, assaulted, threatened children of supporters, entered supporters’ homes without permission and threatened petition signers. Just let them try to get back those nice trash cans from my house. Those are my water storage barrels from rain runoff.